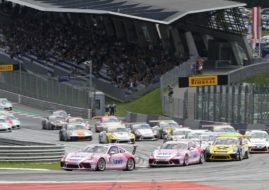 Michael Ammermüller (raceunion Huber Racing) scored wins in both races of the Porsche Carrera Cup Germany at Sachsenring, in the seventh round of the season. In both races, he started from pole and took dominating wins which closes him to the top of the leaderboard but he still has no chances to win a title. Championship leader Dennis Olsen, who finished fifth and fourth in Sachsenring’s races, remains on the top. In both race, Ammermüller was sharing a podium with Nick Yelloly and Larry Ten Voorde (both Team Deutsche Post by Project 1). Thomas Preining (Konrad Motorsport) was on a way to score a podium in the second race but he crashed out on lap 19 from P2, causing a Safety Car intervention. Dennis Olsen leads the championship with 230 points, fifteen more than Nick Yelloly. Michael Ammermüller is third with 176 points. Wolfgang Triller secured Class B championship title before season’s finale at Hockenheimring on October 14-15.